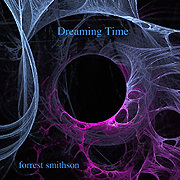 In order to fully appreciate the music of Forrest Smithson one must stop listening. Spinning either Sphere to Locus 29 (63'24") or Dreaming Time (76'18") will fill the listening space with ample synthesized aural textures. But a spell is created by the slow motion ebb and flow of chords, swirling atmosphere and recurring forms that only takes hold within the tenderness of quiet minds. The lengthy pieces of each album are an interesting mix of Ambient Music transparency, sonic Minimalism and New Age bliss. Gently unfolding and growing across 15, 20 or 30 minutes Smithson's realizations act like a shared mind space - and once past the initial introduction helps disconnect the listener from the main currents of the world. 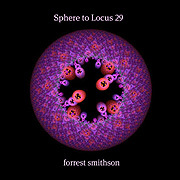 Sphere to Locus 29 contains two lengthy tracks - one searching and expansive, moving in all directions, the other running a sequencer pattern beneath lush synth-string movements into a hypnotic realm. Dreaming Time holds four musical sections that play with an unforced tenderness and warmth. Aspiring to the high horizons of the spirit by way of the quiet impassiveness of rest here Smithson drifts and dreams his music through interesting chord modulations and formulations. At times questioning then comforting these works magically fill up a space with sound then works its way inside - where gently we may explore our relationship with ourselves.